Dwarf Gourami are a type of Asian fish, a fresh water breed of fish native to the Ganges, Jumna and other rivers on the Indian subcontinent. Its scientific name is Trichogaster lalius. It is sometimes called the sunset gourami, red gourami, flame gourami and Polyacanthus lalius. Dwarf gourami are so named because of their size, which reaches a maximum of five centimeters or 2 inches long. Males tend to be a little larger than females. Males have a bright red-orange body, brighter colors than the females. Males have a pointed dorsal fin, while females have a rounded one. A dwarf gourami fish in the fish tank will eat a diet of spirulina or fish flakes; they’ll also eat blood worms, brine shrimp, plankton, and some plants like peas. In the wild, they would eat insect larva. They swim in the middle level of the tank, and do best with water that is 72◦ to 82◦ degree water. They live best in water with a pH of 6.0 to 7.5. They like habitats with lots of rocks, driftwood and pots. You can add live plants to their habitat, but it may be eaten, and they will eat some of the algae. 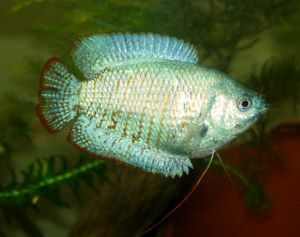 Dwarf gourami are essentially omnivores. They need to eat some plants to maintain their bright colors. This breed is rather peaceful. They are rarely aggressive toward similarly sized fish or the same species. They get along best with other Colisa species. Don’t put them in a tank with large aggressive fish. Small schooling fish are fine, since dwarf gourami won’t eat them. Dwarf gouramis react badly to noise and should be kept in a quiet location. They need to live in a tank at least five gallons large. They live up to four years in captivity. If you want to breed them, add more live food like worms, lower the water level by six inches and raise the temperature to 28◦C or 82◦F. They create bubble nests out of their eggs, so provide plenty of vegetation for the nest to be built.